Monday was the first day in the damages trial concerning the death of five-year-old Michael Komape. By Ciaran Ryan for GROUNDUP. The Chebeng community turned out in force at the Limpopo High Court for the first day of the damages trial brought against the state by the family of Michael Komape. Michael drowned in a pit toilet at a school near Polokwane. He was five years old. The packed court heard how Michael had fallen into the pit toilet on 20 January 2014. He was reported missing at about 10:00 that morning. The family was only informed at about 12:30, the court heard. The family is also asking for a court order compelling the authorities to uplift standards of safety and hygiene in Limpopo schools. The first witness to be called was Michael’s mother, Rosina Komape. She broke down in tears at several points in the proceedings, prompting the judge to order a brief adjournment. She testified that she received a call from the principal of Mahlodumela School at about 12:30 on 20 January 2014 informing her that Michael was missing. She gathered her newly born daughter, Johanna, and walked to the school. She asked the teachers if they had searched everywhere for Michael, including the toilets. They replied that they had searched everywhere, but did not want her to go near the toilets. She went to a nearby crèche to search for her son where she found Michael’s best friend, Tsheo. He told her he had been with Michael when he fell into the toilet at Mahlodumelo School. He pointed out the pit toilet where Michael had fallen in. Michael’s hand was protruding from a pool of faeces. Rosina Komape fainted at the sight of her son’s arm. When she regained consciousness, she asked why no one had bothered to pull him out of the toilet and possibly save his life. “Did anyone from the national or provincial education department talk to you about the death of your child?” asked Maleka. “Despite widespread publicity [surrounding Michael’s death], no one from the department came to talk to you about this?” asked Makela. Anyone from the school, asked Maleka? The principal came to the family some days later to say chairs and tables had been donated to the school. He suggested putting Michael’s name on them. But there was no apparent concern for the well-being of the family. “Have you found closure?” asked Maleka. “No. We are still missing our child,” said Rosina. 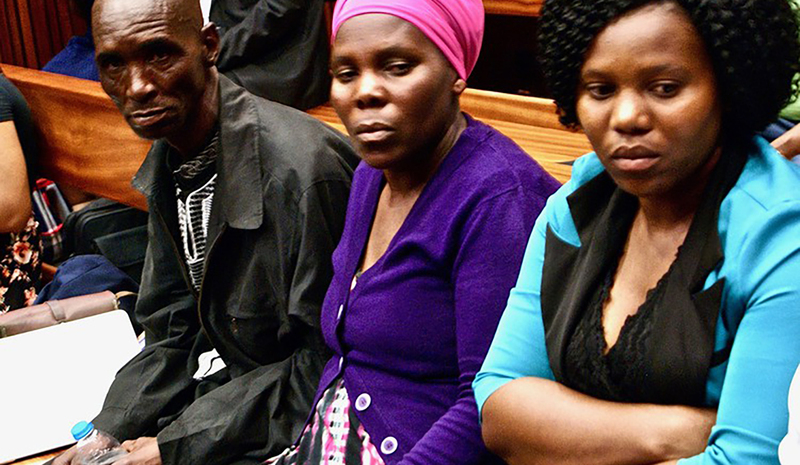 The claims being made against the state by the family include: general damages for pain, shock and suffering amounting to R940,000; constitutional damages of R2-million; special damages arising from psychological damage and the counselling the family was required to receive; special damages for Michael’s burial costs; and loss of income for Rosina Komape, who was unable to work after the accident. The state had conceded liability on most of these claims, said Maleka. Now it was a question of determining the quantum (amount) to be paid. It was also disclosed that the state had attempted to settle all claims in the matter with an offer of R450,000, which Maleka described as “insulting”. Two organisations have been admitted as friends of the court: Tebeila Institute of Leadership, Education, Governance and Training; and Equal Education (EE). EE has been allowed to present evidence in the form of an affidavit detailing the poor state of sanitation in schools, and Limpopo in particular. A 2011 study found 73% of schools still used pit latrines. It argues that very little progress has been made in improving standards of sanitation in schools despite promises by the national government.